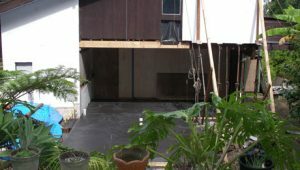 Kitchen Concrete Floor – A mini-celebration occurred last week with our concrete floor kitchen being laid on Friday arvo. It was Friday lunchtime when Jeff rang to say the concrete pour was all go. I rushed home as soon as I finished work and Frank wasn’t far behind me. 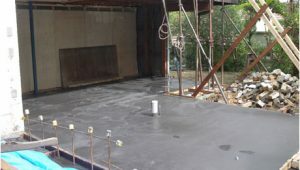 The concrete slab will be the floor for our new kitchen and it looks enormous! You can see the drain for the sink that will be positioned in the centre of an island bench. Frank pulled out the kitchen layout, so we could imagine what it will look like with the cabinetry. The most important thing was that we need enough storage space. And believe me, there’s heaps! I really love the idea of having big handle-free drawers instead of cupboards. That’s was on my must-have list from day one. It’s going to take ages before anyone can walk on the concrete. Jeff has laid out huge sheets of plywood to protect it. At the moment it’s so fragile that a dropped hammer would chip and crack it. The colour is very dark – like charcoal – but Jeff assures us it will lighten as it dries. We’ve also had aggregate added to the concrete mix. This will come to the surface when it’s polished and will add texture and colour to the floor. As I’ve found out, the harder you polish, the more aggregate that will be seen. After seeing the smoky-coloured kitchen concrete floor surrounded by the outside greenery, we’ve been inspired to follow these colours in the interior. 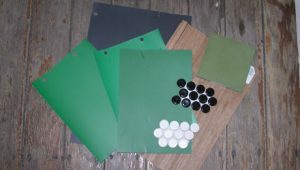 The kitchen colour palette is going to be black/green/timber and we’ll match it in the bathrooms and other rooms in the house. So all weekend, Frank and I brought out colour swatches and clippings from magazines. Originally I was planning to highlight a different colour in every room but thankfully, sanity has prevailed. We’ve created our own little mood board now … and it certainly looks professional stuck on the mini-fridge in the caravan in my folks’ backyard! Check out my artistic photo that shows a few colour options. The other excitement is that the upstairs bathroom renovations has been moving along at great speed. The electrician and plumber will be coming in soon. They’ll be followed by the tiler. So we’ve realised we’d better finalise not only the colours but the materials as well. We always wanted a stylistic link between the upstairs and downstairs bathrooms but we didn’t want them to look exactly the same. We’ve come up with a great idea that I’m very excited about – black floor and green walls upstairs, and green floor and black walls downstairs. And to finish it off, we’ll use the same light timber in both and that will also match the timber veneer in the kitchen. It’s a pretty unusual colour palette but I don’t think we’ll get sick of it. Sam and Ella groaned when they saw us doing our mood board. He wanted dark blue, and she wanted hot pink. Instead we’ve come to a compromise – they can add their own colours in their bedrooms. They can go as wild as they want. In fact, Ella even started grabbing colour swatches and has picked her own ‘mood board’ – pink, orange, green, purple and red. Lovely! Overall, the walls throughout the interior will be white and that’s my next dilemma – choosing the right white. It needs to be clean and bright, although that might be a mistake with two messy children. At least acrylic is easy to wash. The kitchen will have Tasmanian oak veneer on the drawers, then MDF cabinetry for cupboards in green. Frank came across a feature in a magazine that showed cupboards with stripes of different tones. hmmm, I’m not so convinced. Anyway, it’s all action-packed with the reno at the moment. I’ve been so excited; I haven’t even told you about the joys of living in an old caravan. Short version – there is none. All I can say is – come on, Jeff! Keep everything moving as fast as possible!